Bought these for my young grand daughter and she just loves "sleepin in her own garden". The deep pockets are great. They wash beautifully. Thinking of purchasing for my guest room. The digital images we display have themost accurate color possible. However, due to differences in computer monitors,we cannot be responsible for variations in color between the actual product andyour screen. Color is as shown, and is a nice print. However... washed them twice, still scratchy, unlike the Pointehaven sateen sheets I ordered previously which were soft. I grew up with percale sheets, and just because it is a different weave does not mean they should ever be scratchy. Good cotton is never scratchy. It must be the anti-wrinkle treatments or the dyes or something. Another issue, both queen sets of Pointehaven sheets that I have gotten (these and the sateen ones I ordered 4 months ago) had pillowcases that were too short. A standard pillow is 26 inches long, and a queen size pillow is 30 inches long. The pillowcases that came with both queen sets ranged in size from 28 to 29 inches long. That is not even really long enough to keep a standard pillow covered, and is shorter than a queen pillow. A decent pillowcase should be 4 inches longer than the pillow so the opening does not ride up over the pillow during the night. Real quality cases are 4 to 6 inches longer than the pillow. So, not too happy with this set or this brand. Will have to try to remember this when ordering sheets next time. I HATE the new zillion thread-count sheets that seem to be all I can find these days. To me, they just feel flimsy. I was delighted to find these 200 count percale sheets. They feel nice and crisp, and I like them very much. The one surprising thing is that they seem HUGE on the bed. I got the deep pocket because I had just purchased a mattress topper (also from Overstock) and didn't think my old sheets would fit. While these are very large, that doesn't affect the usability in any way. I like them. My favorite sheets, buying another set! these sheets are crisp. They wash very well. They wrinkle, if you don't get out of dryer right away. The colors are bright, makes me feel good to sleep in the sheets. perfect for me. I love the look and feel of these sheets and at a great price. However, the pillowcases are about an inch shorter than my other standard queen pillowcases. Which makes them not quite cover my pillows. If it wasn't for the short pillowcases, I would give 5 stars. I purchased this set of sheets as a gift for my sister's newly remodeled master suite. She had been looking for some pretty floral sheets in king size. Could not find any in king. Only twin and full. When I saw these I thought percale sheets were always nice sheets to sleep in. When she received these she was thrilled at the colors and the design of the sheets. She put them on the bed asap and LOVES them. Thank you for the pretty sheets, some of us like colorful sheets in the larger sizes! I have had my eye on this sheet set for about 6 months now. I had seen it at a department store, but refused to pay $*** for it. When I seen it here for less than $** I jumped on my chance to finally own this set! It is absolutely beautiful. I washed it upon arrival and it washed up very well. You will get some wrinkles in the sheets if you let them sit in the dryer for extended period, but nothing terrible. They feel like old sheets use to (crisp and clean against your skin). Sheets are what I consider over sized which was a plus for the top sheet for me because it actually covers mattress with extra over hang. I will be ordering this exact set again real soon so that I have a spare set. That's how well I like these. I had looked for percale cotton sheets and thought I would never find the crisp cotton sheets. These arrived, And I love, love, love them. They have the stiffness and comfort like the sheets from the 70's that I love. The pattern is exquisite and richly colored but I've never had sheets that have wrinkled this badly. I've washed them twice now and added lots of fabric softener, even adding a dryer sheet but the wrinkling is truly awful. I can't recommend them unless you like ironing sheets for fun. I gave them two stars because they are well made and so pretty but never again. Great percale sheets and love the print. Colors bright and washes well but the sheets are poor quality..too rough. You can see how pretty they are!! I shopped other places and kept coming back to these. I like percale because they feel like sheets. I live in az, Microfiber seem too hot. And they are SO Pretty!! These are the prettiest sheets I have ever had. They are like a watercolor painting. I have had several visitors who commented favorably on them. nice quality, fit the bed just fine, wash up nicely. Love these sheets, bright colors, nice percale! Thank you Overstock for carrying great products! Beautiful. I was looking for something to brighten up my bed and these certainly do the trick. The colors are gorgeous. Washed and still a little stiff, but that’s what I want. I know it’ll soften after a few washes. I love that it doesn’t stretch; never lumpy or wrinkled. I LOVE percale for that reason!! Beautiful colors and design and excellent quality. These sheets are beautiful and have the cool, crisp qualities that I buy percale for. I love them so much that I bought the matching duvet cover! OMG, these are so beautiful, percale, soft, fit perfectly, a dream. I love color and I love watercolor, and these sheets provide an abundance of both. Wash like a dream, feel wonderful against your skin - nothing but the perfect purchase. So happy. These are so pretty, so bright, so colorful and I washed in cold water and came out perfect, no wrinkles. For the guest bedroom as I have 2 solid comforters that match these colors. "will they fit 22" deep full mattress"
These sheets will not fit a mattress that deep. "Could I get extra pillow cases with the Queen size Pointehaven sheet set? I didn't see it as an option? Thanks! Connie from Canada"
At this time additional pillowcases are not available for purchase. Sorry to say that I haven't seen an option for extra cases come up. They're so lovely and reasonably priced, I'd recommend that you purchase an additional set and use the pillow cases from the second set. Then if they wear out, make more cases from the additional spare sheets! I make cases, throw pillows, valances, etc from great sheets regularly! Best to you! I picked this print by default. Where are the beautiful printed sheets of the past? I do not like sleeping on dark solids or dark prints- they make the mind think it is hot. I prefer lighter colours or bold prints (florals are a favourite) I will only buy 100% cotton and prefer percale, never sateen- it pills and it is too heavy. Never any poly in the mix- it makes you sweat when you sleep and it pills too. Wish you had a bigger and prettier assortment of prints. 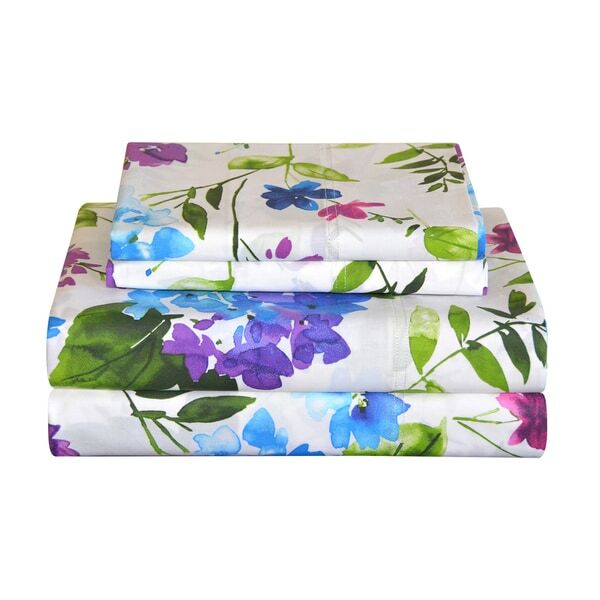 I wanted sheets with a print and these looked beautiful. Hope they are soft.